Among olive trees, gentle hill just outside the walls of the castle of Bibbona 6 km from the sea rises Discount The Poderino. Retrieved from an ancient farmhouse, completely restored in typical Tuscan style, is composed of 4 apartments from three to six beds furnished and equipped with satellite TV, fridge-freezer and heating. Stalla (1): 5+2 beds with spacious living room with sofa bed, kitchen, bathroom with shower, 1 room trilpla, 1 double room, a large porch outside with the garden. 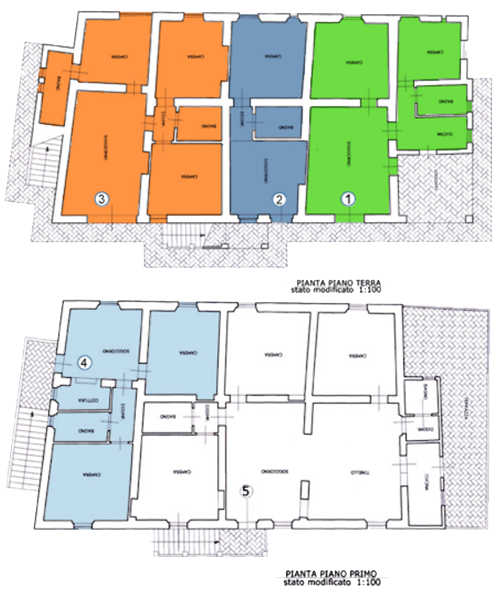 Cantina (2): 3 beds two-room apartment with living room, kitchenette, bathroom with shower, bedroom 3 beds. Carraia (3): 6+2 beds spacious living room with sofa bed, kitchenette, 3 doubles, 2 bathrooms with shower. Fienile (4): 5 beds this apartment is on the 1 st floor, equipped with living room, kitchen, double and triple room, bathroom with shower. In the old barnyard antidistante the farmhouse. In the shade of pines and acacias, guests can eat outdoors, taking advantage of barbecue, wood oven, tables and chairs for recreation then with the ping-pong, games for children, or relax al fresco on armchairs and benches. The excellent geographical position of Bibbona allows to visit the most attractive cities in Tuscany in less than an hour, you can reach Florence and Siena, just 50 km. There are San Gimignano, Pisa and Piombino every half hour from where ferries depart for the Elbe and the entire archipelago Toscano. Bibbona stage is a road of wine and wine-food path that winds between the countryside and medieval villages. At the farm you can buy organic products of the first production as fruit, vegetables and extra virgin olive oil.